Lighting Transformers to be used with the 1 Watt 12 Volt LED Bullet Spotlight, 3 Watt 12 Volt LED Bullet Spotlight and the 1 Watt 12 Volt LED Waterfall Light. Aquascape manual series transformers feature a 6′ cord and durable epoxy sealed housing. 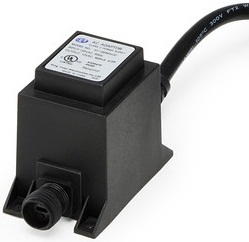 This transformer can be used with all 12 Volt lighting that includes screw on quick connectors. A great transformer to use when manual on/off operation is desired.